This UK story sounds like a joke from The Onion. It is not. The cigarette is not lit. It is just a picture that some 18-year-old mom thought would be cute. A photograph of a baby with a cigarette in his mouth was posted online, prompting a police investigation, it has been revealed. 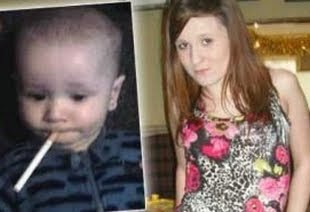 A concerned internet user contacted the authorities after they saw a picture of a baby boy with an unlit cigarette in his mouth on the social networking site Facebook, an Essex Police spokesman said. Officers visited the child's home in Westcliff, near Southend in Essex, but found there were "no immediate concerns" for the baby's welfare. The spokesman said: "Police received the information in the early hours of Saturday about a picture of a baby with a cigarette in its mouth on Facebook. The Fox News O'Reilly Factor legal experts were of the opinion that if this happened in the USA, CPS should take action against the parents. Unfortunately, they said that our laws are not strong enough for a criminal prosecution of the mom, because there is no evidence of any harm or danger to the child. But they said that CPS could interrogate and harass them with home visits for as long as is necessary to make the point that the mom's action was intolerable. This is idiotic. Do I need to explain why? If you told me that there were cops monitoring Facebook for inappropriate symbolism, then I would say that you were paranoid. I doubt that even Communist China does that. You would think that public officials have better things to do than to chase down goofy pictures on Facebook. O'Reilly: Let's deal with what we have. Unlit cigarette in the mouth of an infant. In the United States, this warrants what? Lis Wiehl: No criminal charges. It would warrant followup by social services. Absolutely. Once social services has been contacted and you are on the sheet with them, then they should, they have a duty to come by unfettered, any time. O'Reilly: ... For an extended period, a year, or what? Lis Wiehl: As long as they want. This is all for a Facebook picture. This is crazy. I am amazed that anyone would be willing to go on TV justifying such a silly overreaction. Why worry about the police monitoring FB and the like, when there are willing stoolies everywhere? This reminds me of the story in the states when a video surface of a guy blowing marijuana smoke in a toddler's face. ridiculous. been following you for a while, i'll add you to my blogroll. keep it coming. i think the mom is stuiped for even thinking of that joke..who else would be so dumb....welll she needs parents herself!! !SMOKING IS BAD IM QUITTING ..SORRY I STARTED!! !